crazy and awesome that they flip out ALL the time. I heard that there was this ninja who was eating at a diner. And when some dude dropped a spoon the ninja killed the whole town. My friend Mark said that he saw a ninja totally uppercut some kid just because the kid opened a window. 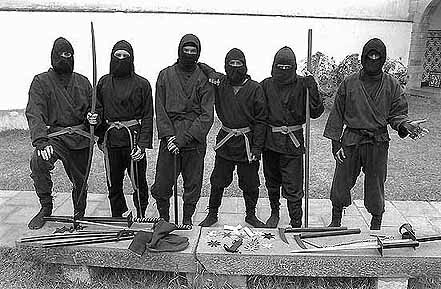 If you don't believe that ninjas have REAL Ultimate Power you better get a life right now or they will chop your head off!!! It's an easy choice, if you ask me. Ninjas are sooooooooooo sweet that I want to crap my pants. I can't believe it sometimes, but I feel it inside my heart. These guys are totally awesome and that's a fact. Ninjas are fast, smooth, cool, strong, powerful, and sweet. I can't wait to start yoga next year. I love ninjas with all of my body (including my pee pee). A: Ninjas are the ultimate paradox. On the one hand they don't give a crap, but on the other hand, ninjas are very careful and precise. Q: I heard that ninjas are always cruel or mean. What's their problem? A: Whoever told you that is a total liar. Just like other mammals, ninjas can be mean OR totally awesome. Q: What do ninjas do when they're not cutting off heads or flipping out?